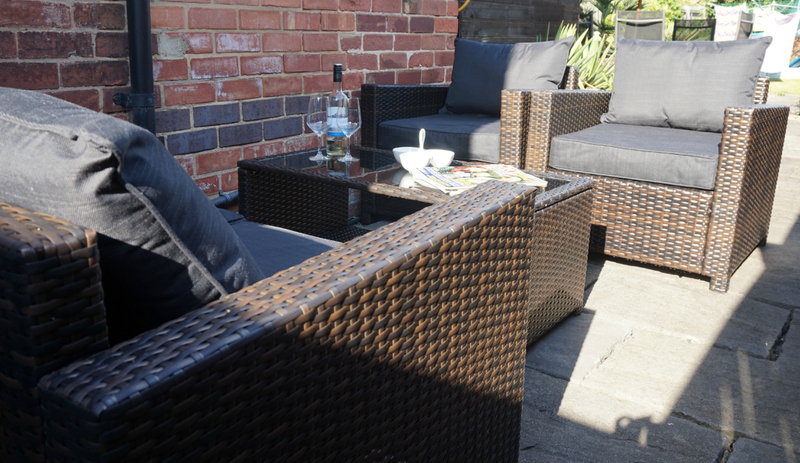 Today’s post features the Asda Direct Jakarta sofa set. So it would appear that this glorious weather is set to continue for a little while. Great news for those us braving the school holidays currently, and for those who love to spend time outdoors. 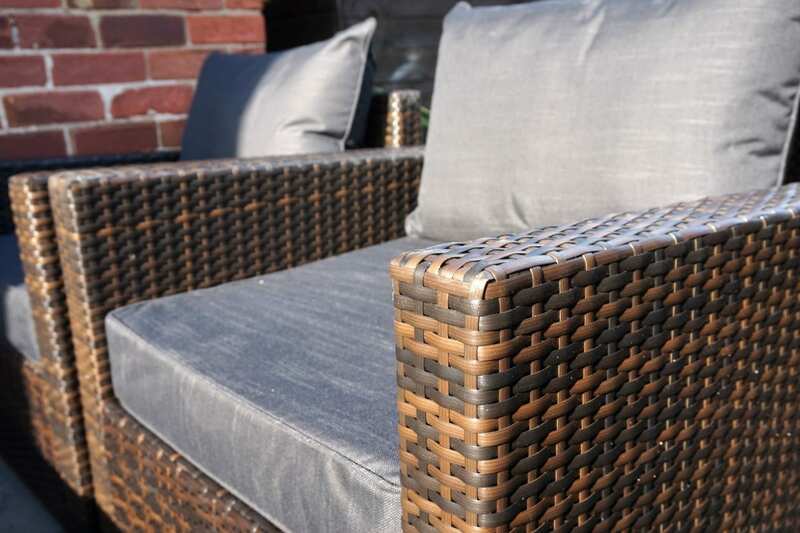 It’s been a long held wish that we invest in some stylish outdoor furniture. Like many people, we can’t afford to treat ourselves to these things all in one go, so each year we build on what we’ve done with the garden, in the hope that we will eventually get there. You may remember last year, the garden had a lovely makeover and I’ve already posted on how some of the plants look a year later. So, this year I planned to update it with some extra luxuries. However, no sooner had I started looking, than I was contacted by Asda Direct, who asked if I would like to take a look at their garden range. 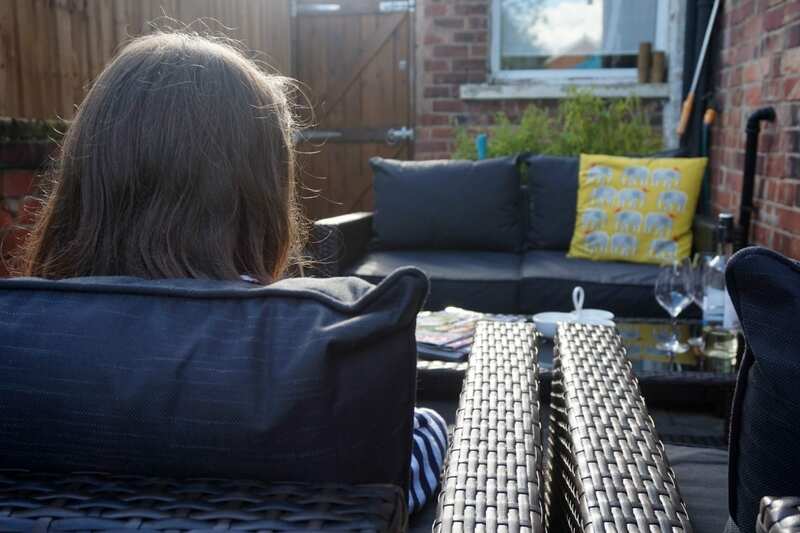 I’m going to be brutally honest, and say it isn’t the first place I would go for stylish garden furniture and accessories, but I decided to take a look. Now, I’m no stranger to supermarket ranges, and think they’ve really upped their game in the last few years. They’re great value too, and pretty much follow the interior trends so you can rely on them for super home decor, but I wasn’t sure in this case. 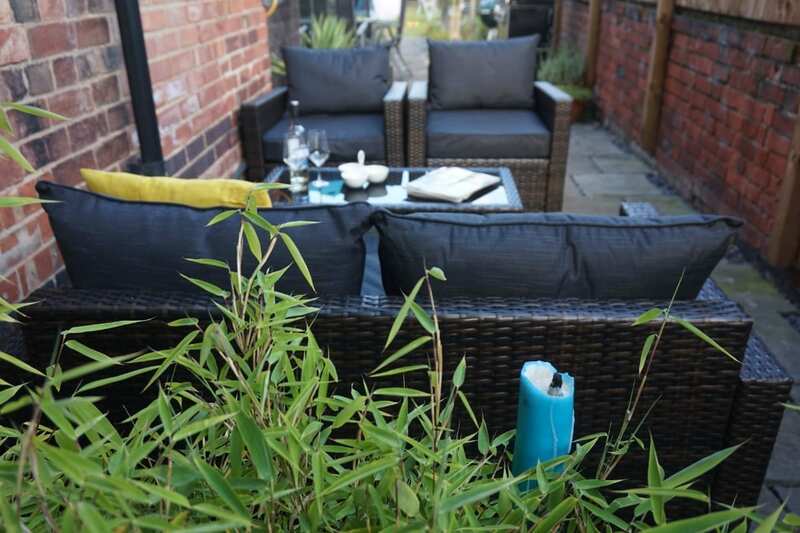 After some deliberation, I decided to give this, the Jakarta Sofa Set – 4 pieces in Charcoal a go, hoping to give the garden an injection of style, comfort and practicality. Style – Of course, on first glance it looks really stylish. Bang on trend, lovely angular design, and great charcoal cushions. Once it was put together and positioned here, outside our back door where the sun falls early in the morning until late in the afternoon, I was thrilled with how it looked. It’s exactly as you see on the website. Quite large, chunky and bold. It’s a lovely statement piece for the garden, and couldn’t look better. Practicality – It’s great for family of four. We’ve had it up for a week now, and of course the weather has been kind, so we’ve sat here reading, playing board games, snacking and drinking. As it’s just outside the door, I am able to sit with my morning cuppa contemplating the day before things really get going. Wonderful. Oh, and the cushions are waterproof. Leave them out in the rain (although not over Winter) and they dry off quickly in the sunshine. Obviously, this darker colour is going to fade if left exposed to the sun all Summer, so I may take them into the shed during periods of low use. 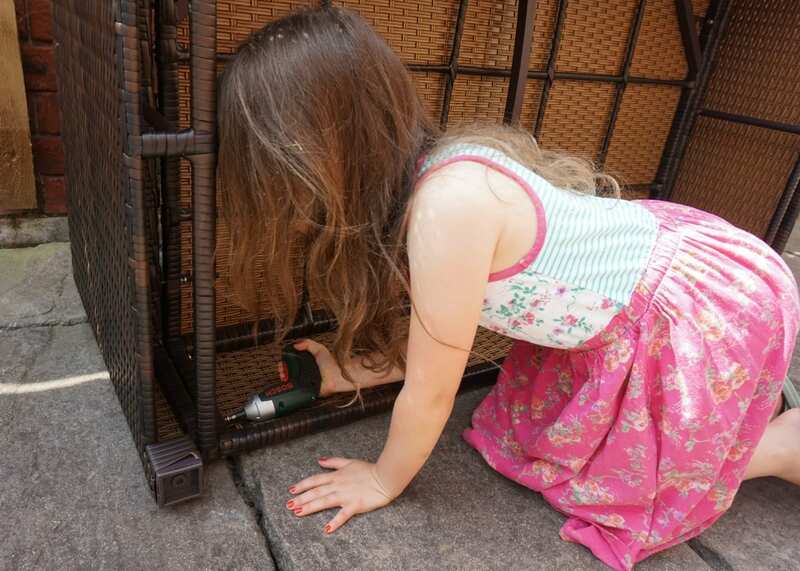 DIY Skill Level – Do remember that you need to build it yourselves. It arrived in a massive box, so big that it couldn’t get to the back of the house. 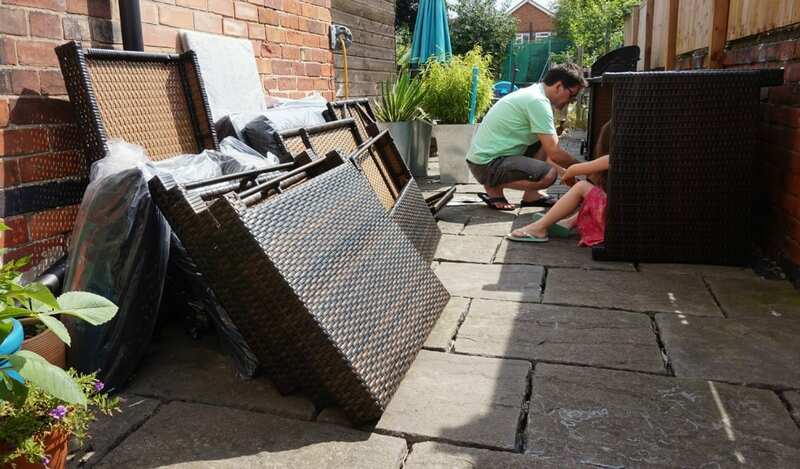 I had to strip it out of the packaging and carry it piece by piece into the back garden. Ok, so not a deal breaker, but something to take into account. My husband put it together over about 2-3 hours (with a little help!). Quality – Once built, it’s really sturdy and solid and seems very well made. It didn’t go together well though. Many of the pre-drilled holes didn’t match up so it took a bit of force to get the pieces together. However, once we had finished, I think we have a very good quality set here that will last many years. Value – The Jakarta Sofa Set in 4 pieces costs £349 which, having looked around is a good price for such a large set. As I’ve said, it seems great quality, and is very comfortable to sit on. 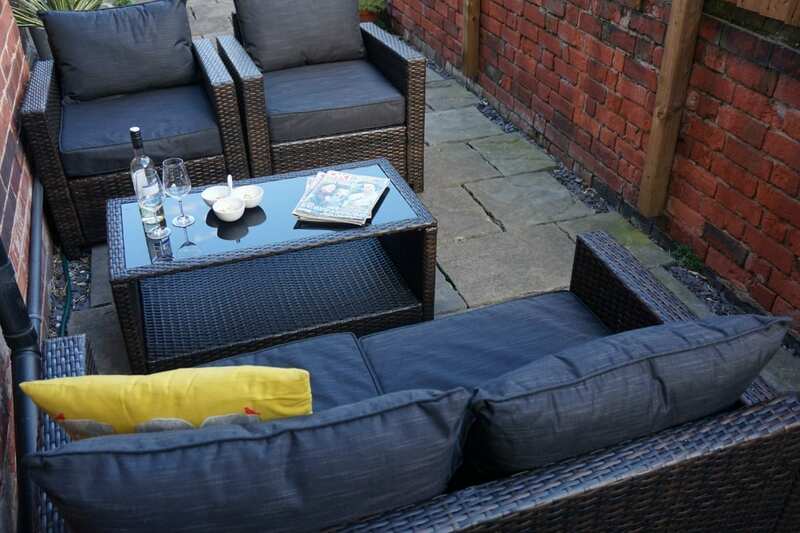 Overall, I’m thrilled with this set, and happy to have my mind changed over buying stylish garden furniture from Asda Direct. As you can see, we don’t have a huge space but it’s big enough for a set like this, so don’t let a smaller garden put you off. If you’d like to find out more about this particular set from the Jakarta range or browse the Asda Direct collection, click HERE. It looks gorgeous! (Also love the models own cushion!) I must admit I find the same issue with the pre-drilled holes on affordable furniture. It’s so frustrating and I’m not sure how they can get it so wrong.